Enfield Council are partnering with London-based cycling company Beryl to bring dockless bike hire to the Borough. Before launch of the bike hire scheme this Summer, parking bays for the bikes will be installed across the Borough. You can suggest locations you think would benefit from a dockless bike parking bay. When someone hires a Beryl bike they can ride it anywhere in Enfield, but are asked to park it in one of the designated bays. If no bay is available, they can leave it parked anywhere in Enfield for a small fee. Click here or on the picture to access the survey and to highlight your suggested location. The Mayor is hosting a Mayor’s Vintage Awards Day at Salisbury House, Edmonton with free admission. We are hoping to recognise many community individuals who make such an impact and difference to our community at Enfield. It will be a wonderful day where all are welcome to enjoy the magnificent heritage building that is Salisbury House. We are extremely lucky to have such a monumental place in our Borough. When: Saturday 20 April 2019 from 10am to 10pm. Where: Salisbury House, Bury Street West, Enfield N9 9LA. Head out and hit your local green spaces this Easter for some fun and fresh air at this traditional Country Fair. You can also browse samples and buy from our range of arts, crafts food drink and gifts marquees as well as outside trade stands. Fully catered & with a licensed bar. Now in its 6th year, there’s something for everyone to enjoy with all day entertainment. When: Easter Sunday 21 & Bank Holiday Monday 22 April 2019 @ 10am – 5pm. Where: Lee Valley Showground, Waltham Cross, EN9 1AB. Attend a free drop-in information event to find out more about Meridian Water and its progress. The exciting £6 billion Meridian Water project will provide 10,000 new homes, thousands of jobs and a lot more and it is happening in Enfield. Work is nearly complete on the new station; you’ll be able to see images and models of what the project will look like and find out more about what’s in the pipeline. When: Tuesday 23 April between 3-7.30pm & Saturday 18 May between 10am and 4pm. Where: Angel Community Centre, 48 Raynham Road, Edmonton. 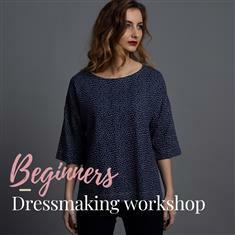 Make a gorgeous top in this dressmaking workshop with everything provided for you; fabric, buttons, thread, sewing pattern and instructions. This class will introduce beginners on how to sew a garment together using a sewing machine. Start by learning how to find your size, cut out a sewing pattern, place the pattern onto fabric correctly, transfer pattern notations and cut. You will learn how to sew the garment accurately and have lots of fun creating your own Drop Sleeve Top. About your teacher: Lisa Falconer is a sewing teacher and the seamstress behind The Avid Seamstress pattern company. You can find Lisa online at The Avid Seamstress. When: Saturday 13 Apr 2019 @ 08:30am to 04:00pm. Where: Forty Hall & Estate, Forty Hill, Enfield EN2 9HA. Explore the farm and get involved in activities, then sit and relax with street food and craft beers from local brewers and wine from the Farm's own award winning Forty Hall Vineyard, (London's only commercial vineyard). When: Sunday 14 April 2019 @ 10am – 3pm. Where: Forty Hall Farm, Forty Hall, Forty Hill, Enfield EN2 9HA. The Black Barn, which has become Enfield's most intimate and atmospheric live music venue, is celebrating its fourth anniversary with arguably the best-known act in its short history. Dr and the Medics appeared numerous times on Top of the Pops in the 1980’s and are best known for their version of Spirit in the Sky which sold several million copies in over 20 countries. Formed in 1982 by Clive Jackson, a former DJ, Doctor and the Medics' musical style has been variously described as neo-psychedelia, glamrock, new wave, punk and poprock. When: Saturday 13 April 2019 @ 7:00pm. Where: Music from Black Barn, Forty Hall, Forty Hill, Enfield EN2 9HA. As well as office space, the 66,000 sq ft building will feature a care, a "state-of-the-art" data centre, a rooftop conference centre and a basement car park. Councillors approved the plans in November after Metaswitch agreed to allow the public to use the company's car park on weekends and weekday evenings. Enfield Council wants to ensure the borough - which has the lowest median gross weekly pay level for full-time workers in London - retains and creates high-skilled jobs. Once again, we are celebrating one of our longstanding, loyal tenants who have stayed 1,000 days in one of our shared houses; many congratulations Charles! Many congratulations to Charles and his housemates who live together in a wonderful shared house in Edmonton. Enfield Council is close to finalising the designs of the A1010 North scheme and welcome your feedback on the draft plans. Copies of the A1010 North design drawings, draft traffic management orders and statement of reasons are available to download by clicking here. You can then provide your comments using the survey by clicking here. Alternatively, you can attend a public event where you can view the design plans and ask the design team questions giving local residents the opportunity to view and comment on the A1010 North plans. When: Wednesday 10 April 2019 between 3pm and 8pm.